Tune into Radio Carly: Blessed by Brenna - the story of an adorable baby with Ichthyosis. My guest post. 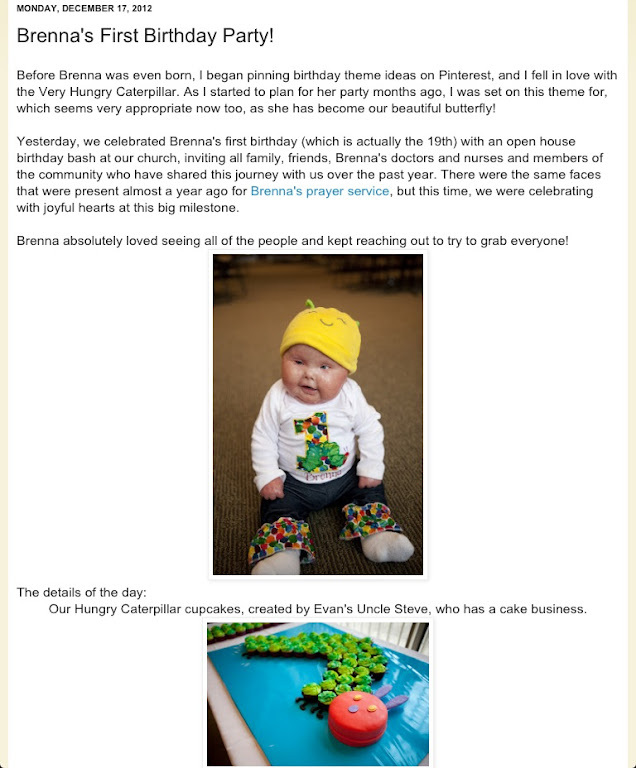 Blessed by Brenna - the story of an adorable baby with Ichthyosis. My guest post. I visit Blessed By Brenna every day, and I love seeing Brenna's developments - and that beautiful smile. I have cried in empathy and squeeeed in delight while reading many of Courtney's words and looking over the photos. I cheer at at the moon-sized milestones Brenna achieves. And I wince when I see her skin red raw. In all honesty, it is difficult knowing the pain and social challenges of this condition affects others, especially a baby so tiny and unable to articulate their feelings. Life's not fair, but life is also blessed, and I also know that Brenna has and will continue to have many wonderful moments because of and despite of her Ichthyosis. Courtney's writing helps me realise and better appreciate what my parents went through in raising me. Parenting a small child with such an unexpected, complex, painful and unpredictable illness is certainly a challenge. I have also learnt a few treatment and laundry tips from Courtney - if only some of those products were available in Australia! She and Evan are doing a wonderful job with Brenna and I am so pleased that they have support from their local Illinois community as well as the whole world - which blogging has enabled. I imagine the great unknown looms darkly with having a seriously ill baby like Brenna, but there is light and comfort in having the support from others who have lived with the condition, and also from those that don't have Ichthyosis and may never have heard of it until they read a blog. I particularly love that like me, Courtney and Evan are raising awareness about Ichthyosis by being in control of their story - to avoid sensationalism of a rare and often confronting condition and appearance. Courtney wrote a great response to recent exploitation of Ichthyosis on social media. Courtney and I keep in touch on Twitter, and she asked me to write a guest post for here blog. I wanted to give the message that Brenna will grow up to be OK, just like me. You can read my full post here. Thank you for featuring me, Courtney, and I hope to meet you all in person one day soon! (Though you'll have double the greasy fingerprints!) 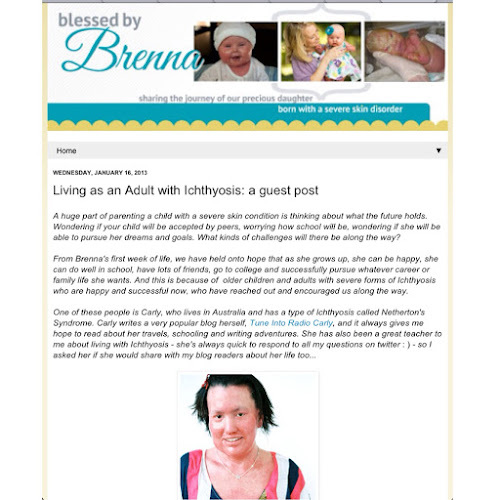 I certainly feel 'Blessed By Brenna' and I thank you and the other Ichthyosis bloggers out there for sharing your stories, and for the support and awareness blogging about Ichthyosis has generated. You can read Brenna's summarised story here. You can also like her Facebook page to keep informed about Brenna's milestones and gush over her cute pictures between blog posts. A very moving blog. Well done for raising awareness.I had never heard of it until I started reading your blog. All the best. Thank you so very much Mary :) I am glad my writing is teaching people about Ichthyosis. So wonderful. Well done Carly and Courtney! Brenna is beautiful and I'm so happy you two are connected. Thank you Katie. I hope Courtney, Brenna and I can meet one day! So beautiful.! Indeed, the story is inspirable!